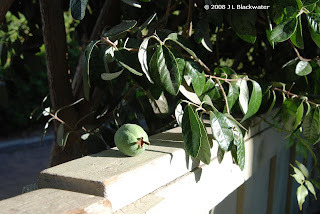 The arrival of our subtle, southern California autumn was heralded these past few months by the soft percussion of hidden guava fruits raining on the path. 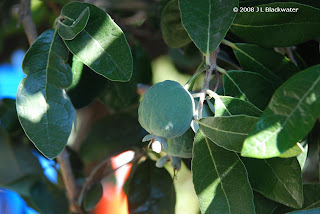 This happy, fruitful little guava tree is the first to greet me each morning at the front gate. 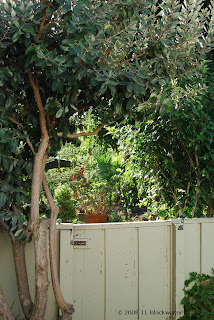 The Santa Barbara Independent recently published an informative article about two species of this small, unimposing fruit tree: strawberry guava, and pineapple guava, which grow in gardens around the area. 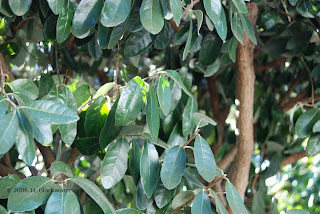 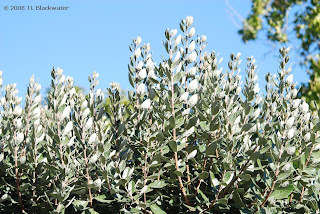 The tree you see here is the pineapple guava variety Acca sellowiana, formerly Feijoa sellowiana.